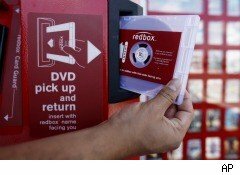 Walt Disney (DIS) is increasing the wholesale prices it charges for DVDs to movies-by-mail leader Netflix (NFLX) and leading movie-rental kiosk operator Redbox, as it looks to benefit further from being the only major studio to sell DVDs to the two companies for rental as soon as they go on sale to the public, the Los Angeles Times reported, citing people familiar with the process. Disney will charge as much as $17.99 per DVD during the first 28 days a video title is on the market. After 28 days -- the point at which the rest of the major studios start distributing their titles to Redbox and Netflix -- Disney will drop its price to $10.79 per DVD, the newspaper reported. Disney first boosted wholesale DVD prices with the Jan. 25 home-video release of Secretariat, the L.A. Times reported. Netflix spokesman Steve Swasey declined to comment. Disney and Redbox representatives didn't immediately respond to requests for comment from DailyFinance. Disney hopes to further benefit from the success of Netflix and Redbox, whose growth has hastened the demise of video chains such as Blockbuster and Movie Gallery. Disney said last week that operating profit for its studio entertainment operations for the quarter that ended Jan. 1 surged 54% from a year earlier largely on the success of home-entertainment titles such as Toy Story 3. Netflix's fourth-quarter earnings surged 52% from a year earlier as the company's video-subscription service surpassed 20 million customers. Redbox parent Coinstar's (CSTR) fourth-quarter net income tripled as the company reported a 31% jump in sales and surpassed the 30,000-kiosk mark.